Let’s talk about the awesomeness that is the Freud Glue Line Rip Blade and why it’s made such an impact in my shop. With woodturning as my main interest, I don’t have a large need for a jointer on a daily basis. Because of this and limited space, I only have two options for truing up glue surfaces before assembling panels. These options are to use a hand plane/sanding block or rely on the surface created from the table saw. Both of these options are substantially more time consuming if the blade isn’t of sufficient quality, as cheaper blades tend to wobble a bit. I’m a firm believer than every blade has it’s place. So you’d better bet I won’t be using my nice glue line rip blade for anything other than ripping boards that I intend to glue up. I have cheaper multipurpose blades that are tasked with cutting up the majority of boards in my shop so that I don’t have to resharpen my quality blades as often. So what’s the big deal with this blade? What exactly is a glue line rip? Let’s just back up for half a second and talk about what the difference is between a cross cut and a ripping blade. First off, these descriptions make the most sense when cutting lumber, not sheet goods or MDF etc. A cross cut blade is designed to…you guessed it, cut across the grain. These blades usually have between 60 and 100 teeth on a 10″ blade with shallow gullets and an ATB (Alternating Top Bevel) tooth design. This design allows the blade to cut cleanly across the grain without tearing or splintering the wood. Cross cutting operations are most often done with the miter gauge or a cross cutting sled. Ripping blades by contrast are designed to cut lumber with the grain, which occurs in the majority of operations that involve using the fence. These blades usually have between 10 and 40 teeth on a 10″ blade with deep gullets and a FTG (Flat Top Grind) tooth design. Ripping blades have a higher feed rate and can handle pretty aggressive cutting. So if you’re ripping material that requires the maximum height of the blade, a low tooth count ripping blade is the weapon of choice! There is a rather significant feature that turns a rip blade into a glue line rip blade and it’s the tooth design. Glue line rip blades have an alternating FTG and TCG (Triple-Chip Grind) tooth pattern. They still have deep gullets to clear shavings and dust, but generally have around 30 teeth on a 10″ blade and aren’t intended to cut much thicker than 1″ stock. 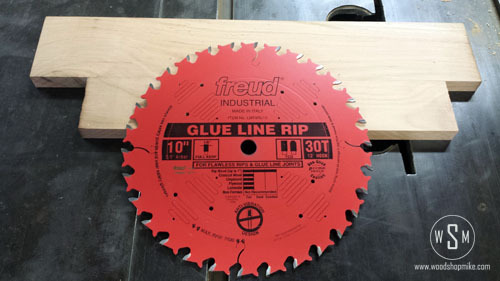 Also, when I picked out my glue line rip blade, I opted for the thicker full kerf version because I wanted the blade to be as stable as possible. Check out the video for a little cutting action of the Freud LM74R010! This blade cuts like a hot knife through butter and has already saved me tons of time in prepping glue ups. Wanna pick up one of these for your shop? Get it from amazon here and help support my blog at the same time! Affiliate links are provided here for your convenience. Making a purchase through these links helps support this site AT NO ADDITIONAL COST TO YOU and helps me create more projects and provide more plans! Generating income from home is the method to go.